After taking a little heat over Part 1 of this 2-part series of posts related to online voting in advance of the upcoming Green Party BGM, I'm going to keep this post a little shorter and a little more focused. In my last post, I explored how the voting process can, and is, being manipulated to the advantages of some. When manipulation occurs, though, there needs to be two parties involved: those manipulating, and those being manipulated. It's my hope that when Members of the Green Party go to cast their ballot, that they are able to see through the bias which is, in some cases, right in front of them, and vote with their hearts and minds. Now, onto business. I'm going to share with you how I will be casting my own ballots for some of the more contentious and/or interesting motions. This isn't being done with the goal of influencing your vote, although I understand that my words might play a small role when it comes to making up you mind. Likely, I'm overselling myself here, and truth be told, I understand that this blog won't be read by very many (especially not those who haven't yet made their minds up, given the late date of publication), and, frankly, I don't pretend to believe that there is really anyone out there who gives two figs about what I think in the first place! Now, with that in mind, let's go forward. There are 5 motions under the heading of “Leadership” on which Members will be voting on. Motion G10-c29, “Party Leader Term”, sponsored by our Federal Council, is the one which gaining the most attention amongst Greens in the blogosphere, while motion G10-d11, “Commitment to Leadership Race” has been receiving some coverage in the national media. Let's look at these two motions first. I'll provide the number and name of each motion, followed by my coloured voting preference, for each of the motions that I'll be looking at. This is the controversial motion being proposed by our Federal Council which, if passed by the Membership, will change the way in which our Party elects its national Leader. It will replace the current process of having a fixed 4-year term for a Leader, with a new process which will mandate a review of the leadership after each Federal Election (unless the Leader becomes the Prime Minister, in which case, there is no opportunity for a review). A “review” will consist of “confidence votes” (my term) being cast by the Membership; if the Leader fails to obtain 60% of the votes of all Members of the Party in good standing, the Leader shall step down and a leadership contest will commence. This motion proposes a completely different route which Greens would undertake in the future to elect a leader. Instead of the expiration of a 4 year fixed term being the trigger for a leadership contest, it will now take the expressed will of the Membership through a review process after a Federal Election to force an end to a Leader's term. No bones about it, the proposed process is quite different from what we're used to as Greens. It is the process which currently exists for just about all of the other political parties in Canada, however. 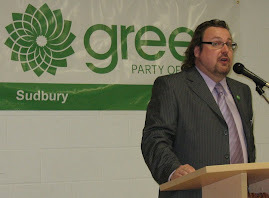 I am not aware of any other non-Green Party in Canada which uses fixed terms for the expiration of a leader's term. Some have suggested that fixed terms are problematic in that a term could expire at the wrong time in an election cycle—either right before an election is called (which could find the party flat-footed with a new and inexperienced leader led to slaughter when the election comes – or which could carry the momentum which a party experiences when a leadership contest is held, carrying that momentum right through the election itself; you'll have to take your pick on this one whether a leadership contest right before an election is a good or bad thing; personally, I'm of the opinion that it's very problematic) or having an election called during the contest itself. Certainly, those fears have been expressed by many Members of our Party, including the majority of Federal Councilors who voted to authorize that this motion be brought to the Membership at the BGM. Of course, there have been a lot of other reasons discussed as to why this motion is necessary. Some of those reasons just aren't supported by the facts. These reasons include the requirement that a Leader step down during a leadership contest; coupled with the fact that an election could be called during a leadership contest, so Greens would be disadvantaged during a Federal election by not having a leader in place. Based on my understanding of the federal legislation which guides elections, and my understanding of the role played of our governing body, Federal Council, between BGM's, it seems apparent to me that the power exists to appoint, including re-appoint, a Leader during a Federal election. Of course, that's just my opinion. As it is my opinion that the Leader isn't actually required to step down during a leadership contest (although I respect that a leader, for the sake of appearing arbitrary, may wish to do so). Others have also pointed out the biggest flaw in this argument: how is moving from a fixed term to a leadership review process going to safeguard the Green Party any better against having a federal election called during a leadership contest? Fact is, it won't. The timeframes for a review and contest could still mean that we wind up in the midst of a federal election when a leadership contest is called, although the chances of this happening are greatly reduced when there is a majority government. Some have suggested that it might simply be better to hold our leadership contests in August, because historically there have been the fewest elections called during that month. But there's no motion on the table to do things this way. My tentative support for this motion isn't based on any of the arguments above, and I have to say that I'm quite dismayed that many of the supporters of this motion have relied on specious political arguments (at best) to advance their support for this motion. I'd much prefer to put it out there, and let the Members decide what's best to do. So, here is my take on the whole discussion. Currently, we have a fairly popular Leader in Elizabeth May. We currently don't have anyone else in this Party with nearly the same national “presence” of May. Since the 2008 election wrapped up, we've been developing a strategy of focusing our limited resources in getting our Leader elected in the next election. Some have called this the “Putting All of Our Eggs Into One Basket” strategy. Like it or not, it's what our governing body has decided to do. The theory here goes this way: if we elect a Green to parliament, and a dynamic Green with national recognition at that, voters will see that there really is an alternative for them when the next election is held. Also, we'll gain considerable national media exposure because Elizabeth May is a little dynamo. Some have pointed to the Reform Party here as well; back in 1989, Deb Gray was elected the first MP for the Reformers, and eventually that Party grew to become the Opposition, and when merged with the PC's, the government. I largely buy into this strategy, but it does have its detractors. Others feel that we should be focusing our limited resources on building strong Electoral District Associations with identified supporters in each of our communities, so that when the writ is dropped, we'll be able to count on a strong core of supporters and voters. Actually, that's my preferred way of doing things. But the Green Party's presence in the vast majority of electoral districts is so very thin on the ground that I believe it would be a very long-term process to pursue this strategy alone without also electing one or more Greens to parliament. For me, it's extremely vital that our Party elect someone, somewhere, this time around. Elizabeth May and Bob Bell probably have the best chances. That's where our resources need to go. With my support of the campaign strategy in mind, I believe it would be foolish in the extreme for this Party to go into a leadership contest right now. Which is where we will be going if G10-c29 isn't approved by the membership, because that's what our by-laws require. While a leadership contest could lead to some renewal in the Party, the timing just isn't there. Right now, our current leader's position within the Party really isn't going to be challenged successfully by anybody, particularly not within the 4 short months now available for the completion of a leadership contest. If May is perceived as having a strangle-hold on the leadership, what self-respecting leadership hopeful would dare challenge right now? A better strategy for leadership hopefuls would be to wait for the next election, and see how well May fared. If she fails to win her seat in Saanich, she'll be vulnerable. If she does win her seat, but Green vote share slips, her leadership of the Party could still be questioned (why are we taking this step backwards?) and a case could be made for replacing a dynamic media-savvy individual (who now has work to do in parliament) with a nuts-and-bolts, build it from the bottom up technocrat. I also think that the public will perceive our Party to be one in conflict and crisis. Why are the Greens getting rid of Elizabeth May? She was the only one doing anything, wasn't she? Do they really think they can do better? Who are they going to replace her with? Is David Suzuki running? At this time, in the summer of 2010, with a federal election expected somewhere out there on the horizon, likely within the next 9 months, that's the sort of confusion in the mind of the public which I believe we do not need. Not as a national party, and not as a party which has chosen to put all of its eggs into one basket. Certainly May's own campaign in SGI will be dampened if she gets dumped as Leader. Further, forcing May to fight a leadership contest in the first place, one in which she has categorically stated she would resign to fight, she will not be able to focus her energies in SGI, the riding in which she wants to get elected. Instead, her energies will be all over the map – literally, as she'll be involved in a national campaign to re-become the Leader. In my mind, having a leadership contest right now is just plain bad: a bad idea for serious leadership contestants, a bad use of resources, leaving a bad bad bad impact on the perception of our party in the minds of the voters. And that's not to mention any lingering ill-will which might remain at the surface amongst Greens ourselves after the outcome of the contest (not that that ever happens, eh?). So, in my mind, we've got to do something about this. There is actually another motion on the table for Greens to vote on which would, in fact, do something: G10-c12, “Amendment to By-law 2.1.4.5 – Allow Extension to Leadership Term”. This motion would have the effect of permitting Fed Council to arbitrarily extend the Leader's term for up to one year, while keeping the 4 year fixed term in place. It would clearly get us out of our current situation. But, what next? I also believe that there needs to be some flexibility in the Constitution and its by-laws whereby a relatively popular leader shouldn't be distracted from fighting for their continued position in a leadership contest which likely won't lead to a different outcome anyway. Let the leader's popularity be expressed by the Membership through a review process instead. If the Leader remains popular, that's your answer. Of course, some have suggested that a popularity contest isn't the best way to elect party leaders, and there are several points in favour of that argument. One of the biggest: who actually casts their ballot in favour of or against the Leader? Although our party is grassroots and in favour of open democracy, we have a hard time implementing some of those concepts amongst ourselves. In this case, it's fair to say that the typical Green Party members isn't very engaged with what's going on inside of the Party. Most often, the typical Green won't be voting for motions through an online process, or be able to make it out to the BGM. The typical Green doesn't usually vote for Fed Council positions either. Yes, likely the typical Green would be more apt to vote in a leadership contest, and maybe a little more apt to vote in some sort of review process, but largely our Membership has not been all that engaged in decision making within our Party. This means that any current Leader is going to have an advantage in any review process, unless of course the media spot-light has been so intensely focused on that Leader's shortcomings that Members can't help but see the faults in all of their gaudy glory (something which no Green Party Leader in Canada has yet to face). Maybe in part to counter this, our Federal Council has set the threshold of acceptance at 60%. Seems just about right, maybe, or even a little low? Not at all. And thanks to Stephen Lefrenie for pointing this one out to me. The threshold of support required to avoid a leadership contest is actually 60% support of all members in good standing (that's paid up members). It's not 60% of the votes actually cast. It's 60% of all voters. So that means if Green in good standing doesn't cast a ballot at all, they can't be counted on to support the current Leader. And here's why I think we need to workshop this motion. Although a sitting Leader will have an advantage in a review process, given the level of engagement of our Party Members, the approval threshold is out of line with reality. Certainly a leadership review, under these rules proposed by our Federal Council, will almost always lead to a leadership contest. And I'm not sure that that's the sort of flexibility we were looking for. No, we need to change this threshold, and bring it up to 67% of the votes actually cast. If Greens can't be bothered to cast their ballot, their opinions (whatever it might be) shouldn't be counted against the Leader. It'm all for grassroots democracy, but if voters don't bother to vote, I can't endorse giving their voices equal weight to those who do cast their ballots. So we need to workshop this motion. I'm very surprised that our Federal Council decided to structure this motion in this manner, given the almost certain outcome of almost always gauranteeing that a leader fail a review. The optics of failure are incredible, especially in the national media. Why set our leaders up for this kind of negative exposure, especially if they receive a majority of the votes actually cast? Maybe that's not what happened though. Maybe, after the several months which this motion was being considered, perhaps they just missed this little implication. Naw...it couldn't be. Could it? Given that I generally support Federal Council's motion to change the way in which we elect a Leader, I can't support this motion, which suggests that we Greens follow our Constitution and have a leadership contest now (to begin no later than October 31st, according to the motion). So, that's a big issue which I can't reconcile. What I also find interesting about this directive motion, though, is that it actually directs the Party to violate our current Constitution and by-laws. Right now, our Constitution and by-laws require that we elect a leader in 2010. This motion, despite some flowery language about the need to respect our Constitution, would direct that we ignore the Constitution and extend the contest into 2011. Again, it's amazing how language can say one thing, but actually lead to something else altogether. With that in mind, is it any surprise that one of the sponsors of this motion is Sylvie Lemiuex, who has recently told Greens through the national media that she wants to be our Leader? She's referenced this motion a few times now to the media as well (at least, I believe she has mentioned this specific motion...she actually keeps referring to a motion which she will “introduce” to the Party at the BGM in Toronto. If there is a second motion out there with her name on it pertaining to the leadership question, best of luck introducing it as an “emergency” measure, given that this issue has been percolating now for at least 6 months, and given that Lemiuex has fully participated in the process of submitting motions. So I have to think that she actually means G10-d11 when she talks to the media about “her motion”). Despite the fact that this motion might not even be brought up at the BGM (because it might be RED-voted down by the Membership), Lemiuex seems bent on portraying herself as the saviour of the Constitution while proposing to violate that same Constitution of ours for not better reason than her own political gain. By proposing to extend the leadership contest into the spring of 2011, she will give herself more of a chance to build a national profile. She will be able to continue to chastise our governing body, Federal Council, by not following the Constitution (which says we'll elect a leader in 2010) despite the fact that it would be her motion which led to the violation. And she'll have the leadership contest end dangerously close to the time in which the federal budget is brought down; that's the budget which is going to be the most likely trigger to a federal election, by the way. This action of hers makes me very angry, mostly at the political cynicism demonstrated by Lemiuex, who claims to be a champion of process but who, in her first foray onto the national stage, seems determined to grind that process beneath her boot-heel. But I'm also angry at Federal Council for permitting this motion to be voted on by the Membership in the first place. It has no right to be there. It is a directive motion which would direct that our governing body, Federal Council, violate the Constitution. The motion does not seek to amend the Constitution or by-laws; it calls for an outright violation. It should have been ruled out of order, and the Membership ought not to have been asked to vote on something which would put Federal Council in such an awkward situation. And those are probably even better reasons to vote RED on this motion. More to come in later blogposts, folks, time permitting. I honestly didn't think having a new baby would impact on my time so significantly. And with that in mind, there's further testament to my own powers of observation!